JEE Main 2019 Application Form has been released by the NTA. Now forms are over for the JEE Main 2019 ( January) and forms for JEE Main (April) will release in the month of February 2019. NTA releases correction facility. The JEE Main 2019 Application Form are made available on the official website. The candidates need to fill in the application form with all the genuine details. Candidates can fill the application form for either appearing for this entrance in the month of January or April, as per their convenience. Candidates can also appear in both of these months and apply to institute with the one with better JEE Main score. For more such JEE Main 2019 Application Form related information, candidates can have a look at this page. A candidate’s candidature will only be considered to be valid if he/she is meeting the eligibility criteria and has submitted his/her application form (along with the specified fee) before the last date as per the schedule mentioned below. Application Status: Candidates can check details application status form this page. Apply Online: Candidates can apply for JEE Main 2019 April examination from here. Please check all the jee main 2019 dates carefully, as specified tasks can be performed only as per the schedule. As per the official announcement, the application form fee would remain unchanged, which is given below. Candidates are advised to be ready with all of these documents. So that, JEE Main 2019 Application Form could be filled on time. Some of them will be needed by the candidates for the purpose of reference and other, needs to be uploaded. While all of these documents will be needed at the time of counseling for verification purpose. Confused regarding how and from where to fill your JEE Main 2019 Application Forms from? We have got it all worked out! Follow these steps to lead your way to successfully applying for JEE Main 2019 Exam. Visit the official website or link on this link. 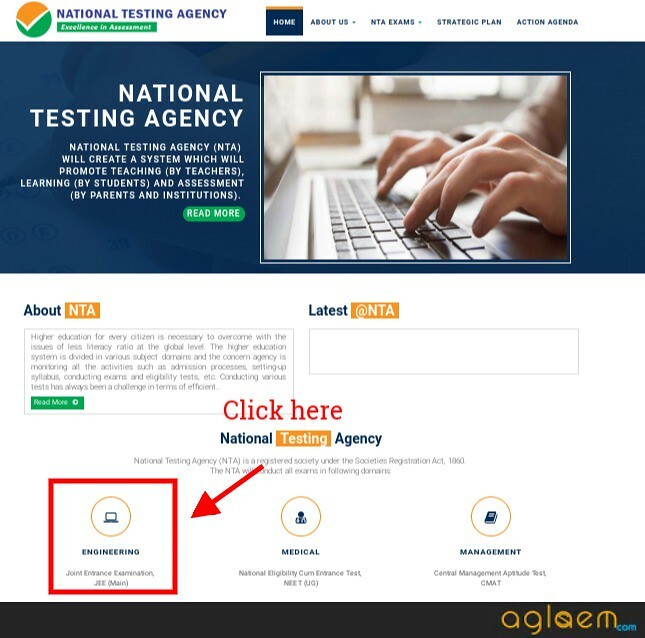 Scroll down to click on the “Engineering” link from all the other options listed under NTA, from the main page. 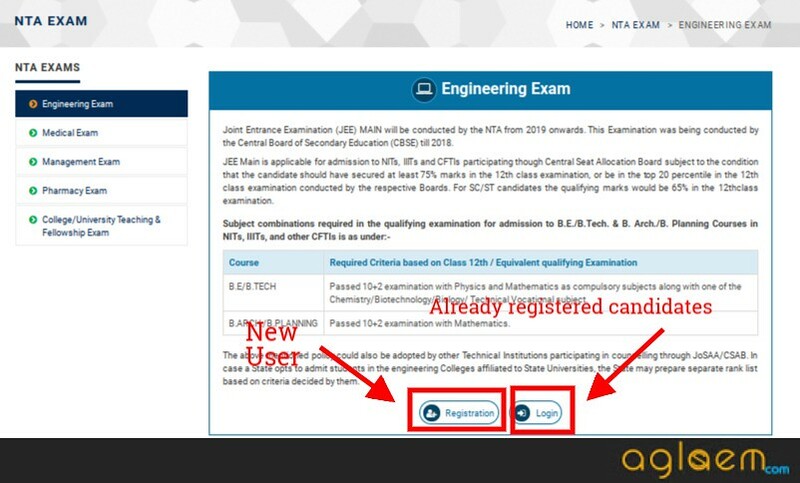 Candidates can then click on the “Registration” button to register with NTA and “Login” button to log in to fill up the JEE Main 2019 Application Form. Note: As from this year onwards, JEE Main 2019 will be held twice a year. The availability of the JEE Main 2019 application form will be different. For candidates wishing to apply for JEE Main (January 2019) needs to fill the forms in the month of September 2018. Whereas, candidates applying for JEE Main (April 2019), candidates can fill the application form in the month of February / March 2019. Sir…I have to give jee 3rd time this year then plz tell me is I am available for both the papers or not ..This year? Am I eligible to sit in JEE 2019 with 71.80% in CBSE 2017 ? Yes you can appear for JEE Main 2019, however to get admission through JEE Counselling (in IITs / NITs) you need to have minimum 75% marks. I too am going to reappear the 12th board exams as a private candidate and I’m also facing the same problem. If you get to know anything about this please share the information with me as well. How many times can i appear for jee from this year? I mean total number of times i can appear for jee if i do not get good results. Is income certificate mandatory for everyone, even though we are not claiming any reservation? Sir, Income statement means what?. is it Parents income?. Whether Current month statement is ok?. At what time will the forms be available? at midnight or in the morning? jee main application form released. I am 12th standard student of Science stream from Assam, I am going to appear the H.S. Final year exam that will be organized by AHSEC Board, Guwahati(ASSAM). Am I eligible for appearing in the JEE Main 2019? Please tell me what important documents or things that I must submit during the submission of the application form, because I have not yet an Adhaar card with me, it is not yet made. Kindly please respond to my comment. I AM SAI SUBHSH I am appear Jee Mains . I am suffering from Visual Impairment and i have 40 % disability certificate issued by Medical board Guntur General Hospital ,Guntur.Am I eligible for avail 1 hour extra time and Considered Pwd Category ? Yes. As you need at least 65% marks in 12th class examination, or be in the top 20 percentile in the 12th class examination conducted by the RBSE. Sir I have passed CBSE exam in 2017 I have 6 subject and I have passed CBSE in 5 sub but j failed in maths and it transferred into 6th subject…so in this year I am giving again maths from CBSE board..can I get admission in college after giving jee mains ..??? ?Can you plz contact on this no…7044470438… waiting for your replies…..Thank you….